Earlier this month, the new ‘Good to Go’ service replaced the Friendly Bus sheltered shopping service that has been operated by Stagecoach for a number of years. I advised at that time that there would be alterations to the timetable compared to the former the West End Friendly Bus timetable (although the day for the West End remains unchanged – Tuesday) . 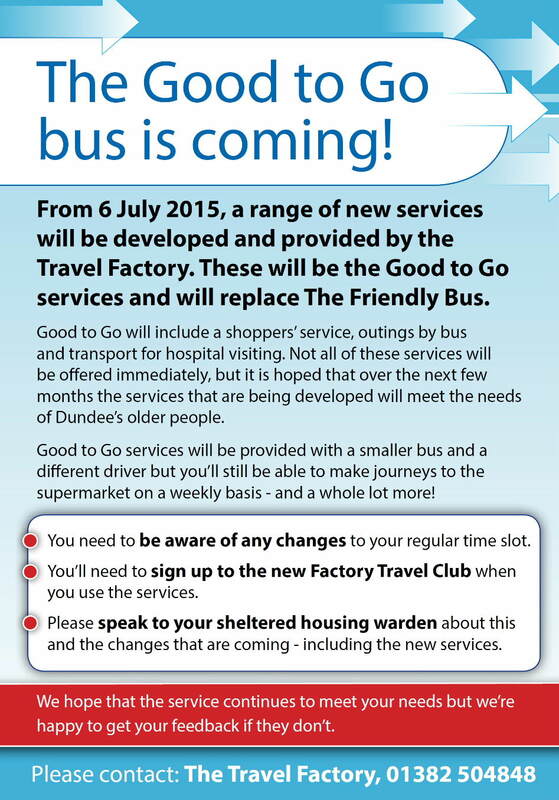 From this week, Factory Travel will be delivering a number of new travel services for elderly people in Dundee. The new services, badged as ‘Good to Go’ will replace the Friendly Bus sheltered shopping service that has been operated by Stagecoach for a number of years. While the Travel Factory will retain a weekly supermarket shopping service, it will also provide day trip opportunities and organised outings for older people. It is also hoping to develop services for hospital visiting and other useful services in the months ahead. A poster with information is below. I understand that there will be alterations to the timetable for the West End Friendly Bus timetable (which runs today – Tuesday) but that sheltered housing complexes have been contacted about this. If any resident has any query or problem about the changes, please give me a call on 459378 – many thanks. Over the past few weeks, I have chaired a number of meetings across the West End at various sheltered housing complexes. Quite a few residents make use of the Friendly Bus shopping service, but some residents were not aware of the service, so I have since arranged for copies of the timetable to be handed into the sheltered lounges concerned. I still have some copies – so if any resident would like a copy, just call me on 459378. Alternatively the timetable can be downloaded here. With the commencement of road works in Nethergate and the very east part of Perth Road up to Roseangle started today, I have had constituents ask about the effect on bus services 204 and 204a and also the Friendly Bus Sheltered Shopping Service that goes to Paton’s Lane Sheltered Housing each Tuesday. “Service 204/204A will still use Magdalen Yard Road when Nethregate works are in operation. Members of public should be aware that the buses on Magdalen Yard Road will all travel in an Easterly direction, both travelling towards City Centre and Ninewells Hospital. Towards Dundee City Centre, the service will operate from Hyndford Street, then Windsor Street, Magdalen Yard Road, turn left at top onto Perth Road then turn right onto Hawkhill at Blackness Library, into Dundee City. These diversions are in operation from today until Friday. 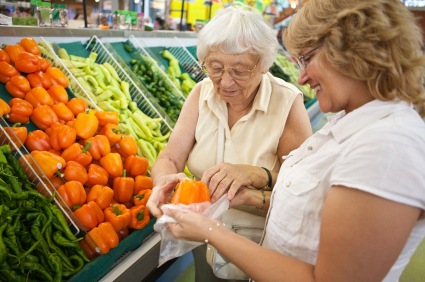 The Friendly Bus sheltered shopping service is a great – and free – service for elderly folk to get to local supermarkets, have a good period of time for shopping, and get the bus back home. Having campaigned for the inclusion of Morven Terrace/Ancrum Place sheltered housing and Richmond Court to be included in the service, I was delighted that they were added to the timetable last year. There are new timetables in operation from week commencing 5th March – Tuesday remains the day that the West End is served. You can download the new timetable by going to http://tinyurl.com/friendlybus2012. From Monday 15th August, there will be changes to the Friendly Bus – the shopping service for sheltered housing residents. The service will still run on a Tuesday in the West End (and on other days in other parts of the city) but the good news is that at last Richmond Terrace/RichmondCourt finally has some bus provision – this will be a boon to several elderly residents there – and the Ancrum Place/Morven Terrace sheltered housing will now also be covered by the Friendly Bus. I have a meeting with the tenants at the Morven Terrace/Ancrum Place sheltered housing area on Monday and it will be a good opportunity to update residents about the service – whilst discussing a number of other issues of concern to the tenants – fencing and maintenance of the grass areas in the estate being amongst them. You can download a copy of new Friendly Bus timetable for the West End by going to http://tinyurl.com/friendlybus.